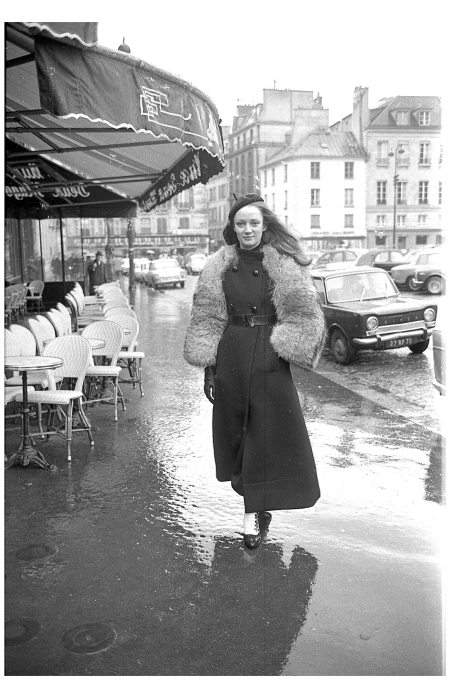 The relationship between Niki de Saint Phalle and Fashion is strong and significant. She expressed herself through Fashion, she had a vision and designers believed in her sense of style and advice, like Marc Bohan, at the time, the designer for Dior. At 20, she was a model, on the covers of Life and Vogue magazines. At 30, at the beginning of her artistic career, she said to the NYC Herald Tribune : […] I don’t mind wearing high heeled boots or a flower in my hair if I am in the mood. I think clothes should make a statement. Mine do. They’re the way I feel. 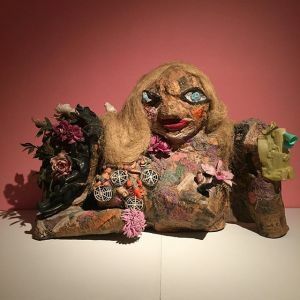 A year later, Niki de Saint Phalle’s solo show opening of “Les Nanas” at Galerie Iolas in Paris was memorable not only for the joyful feminine figures made of chicken wire, fabric and yarn but for the real women in the room, too! 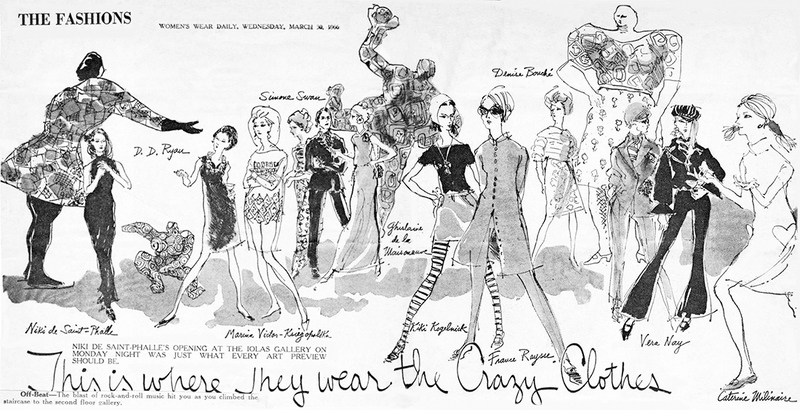 In an article published by Women’s Wear Daily on March 30, 1966, it is described in detail every extravagant outfits wore by the Paris’ It girls, among them, of course, Niki! Niki de Saint Phalle has always been a great source of inspiration for artists: painters, sculptors, jewelers… And again, very recently, we noticed how much fashion designers today keep borrowing her graphic elements and color palette to nourish their creations. A month ago, during New York Fashion Week 2016, Japanese designer, Anna Sui incorporated Saint Phalle‘s Nanas in dresses and capes, as parts of her latest ready-to-wear collection. Also, Libertine American designer, Johnson Hartig, dipped into Niki de Saint Phalle’s graphic repertoire for his latest creations. The open-hand, the heart and the sun symbols, just to name a few, are distinctive reacquiring elements from Saint Phalle’s alphabet that Hartig incorporated to dresses. 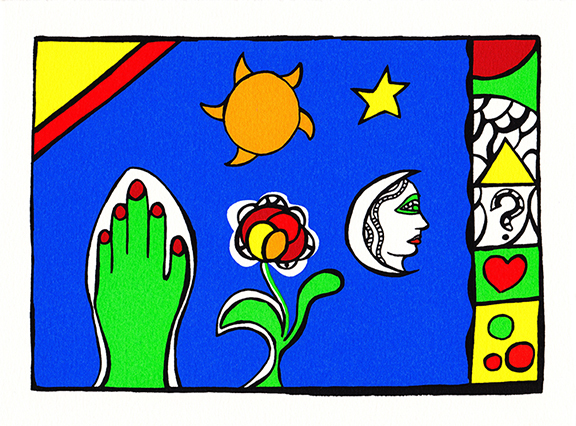 Carte de voeux with Flower, Sun, Start and Moon, 1987 © 2015 NIKI CHARITABLE ART FOUNDATION, All rights reserved. “I studied painting and drawing in school so art has always been near and dear. Niki de Saint Phalle, and the Tarot Garden Tuscany were big inspirations” told Hartig to Fashion Times reporters, backstage after the show. 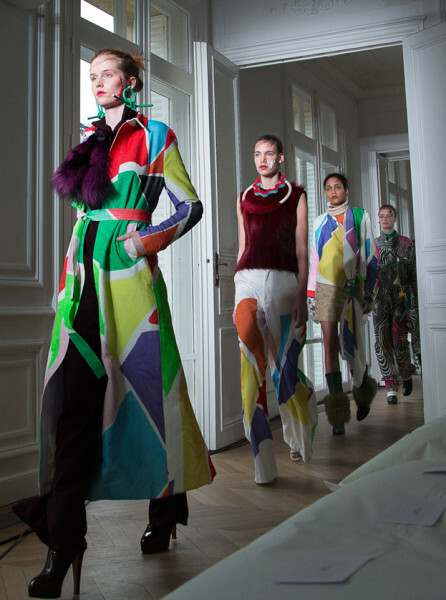 Two weeks later, on the first day of Paris Fashion Week 2016, Dutch designer Liselore Frownijn, using Niki de Saint Phalle as a muse, paid homage to strong and artistic women with her collection ‘Let’s Hear It For The Lions’. The collection was made of voluminous tunics, curved bomber jackets and wide-legged trousers. ‘They’re very naïvely done in a bold way with primary colors, bold shapes, round volumes, polka dots. 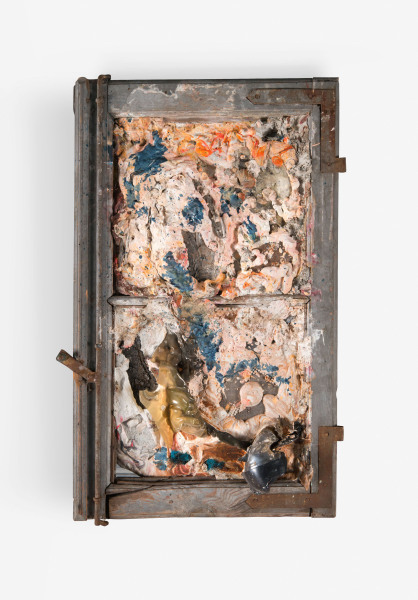 It’s a very optimistic way of creating and I wanted to catch this energy that I got from her (Saint Phalle’s) work in the collection,’ says Frowijn. Since 2015 the French stylist, Axelle Migé, behind the luxury brand Coppelia Pique, has created two collections inspired by Niki de Saint Phalle! Through her dresses she gives life to Tir, Nanas, Tarot Garden and, expressed in her own way, the macabre tension surrounding La Mariée. Tir (Old Master), 1961 © Niki Charitable Art Foundation. All rights reserved. La mariée, (Eva maria), 1963 collection Centre George Pompidou © Niki Charitable Art Foundation. All rights reserved. Niki de Saint Phalle hoped her Spirit would live on through her art, and inspire generations through time. 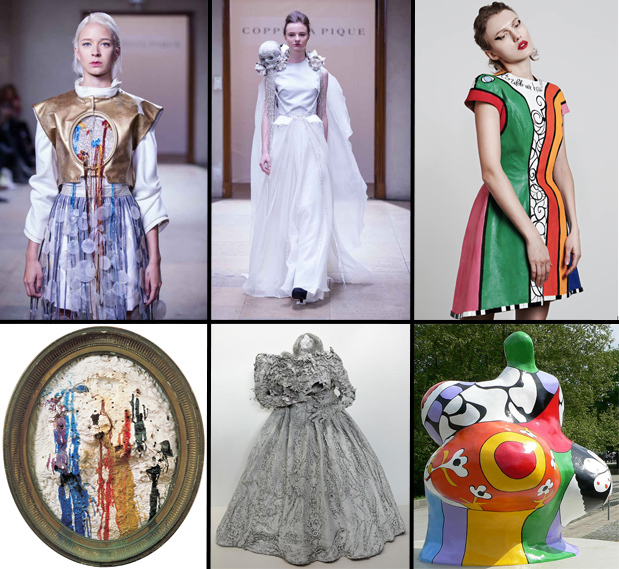 Fashion may be ephemeral but Niki de Saint Phalle’s influence continues! 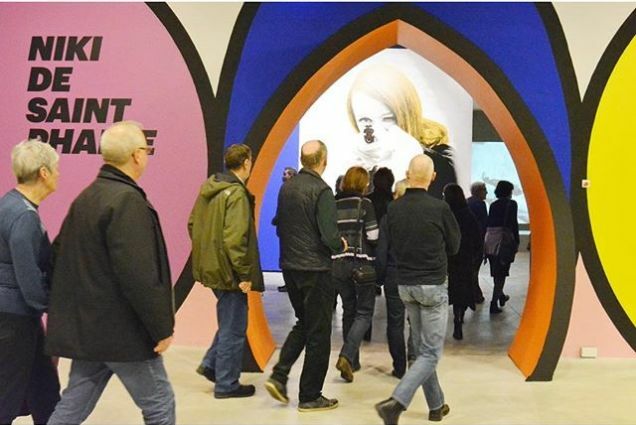 On February 13th, a new retrospective of Niki de Saint Phalle’s artworks opened at ARKEN Museum of Modern Art in Copenhagen, and is on view until July 31st. The ARKEN website provides detailed information on the exhibition with multimedia resources. With its innovative design the entrance of the exhibition is reminiscent of Hon built at the Moderna Museet of Stockholm in 1966. A large portrait of Saint Phalle, excerpt of her film Daddy, “welcomes” visitors with a pointed rifle. Some highlights of the exhibitions feature L’Accouchement Rose (Pink Birth) and Marilyn both from 1964. Niki de Saint Phalle created this figurative assemblage of Marilyn Monroe two years after the actress’s death, and almost at the same time Warhol made pop prints her smiling portrait. But here, instead of the familiar pin-up, Saint Phalle assembled a papier-collé bust with dramatic make-up under blonde hair. A wild boar climbs between flowers on her shoulder, one of her breast is covered with fans and baby dolls. Her hand is cut off, and instead there is a dense colony of small pink bananas like maggots on rotten meat. The sculpture expresses the martyred emotions of a female icon behind the colorful picture that society created. In a room dedicated to Tirs (Shooting paintings), cathedrals, altars and even the Venus of Milo are bleeding colors. They are the violent remains of an execution where nobody dies. Niki de Saint Phalle described her process: “[…] I was shooting at my own violence and the VIOLENCE of the times. By shooting at my own violence, I no longer had to carry it inside of me like a burden. It was a great therapy for me.” Two pieces displayed in this room are fragments of an impressive Tir tableau Saint Phalle shot at Galerie Køpcke in Copenhagen in 1961. They are being shown to public for the very first time. 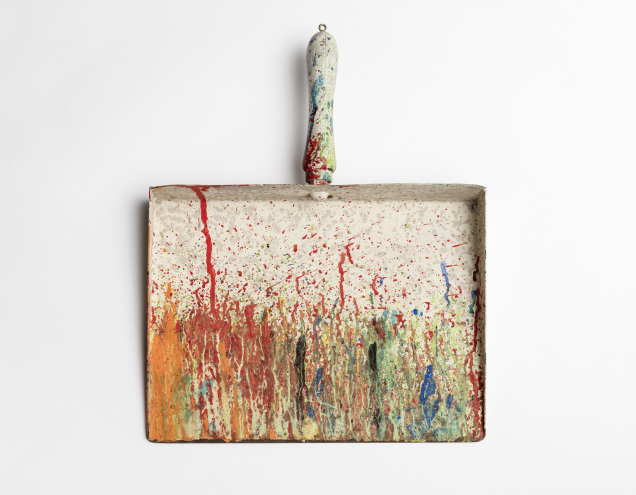 Tir (fragment de tableau Galerie Køpcke), 1961. Furthermore, many of Saint Phalle’s architectural projects and models are on featured. Le Palais (Auberge) is a large model from NCAF collection, recently restored to be shown in this extraordinary exhibition. Le Palais envisions an artist community in Saint Phalle’s unmistakable style with undulating archways, playful decorations and colorful figures. We hope you visit Niki at ARKEN and share your thoughts and pictures online #NikiPower ! We would like to thank the ARKEN Museum staff and guests, curators Camille Morineau and Lucia Pesapane, as well as Galerie GP&N Vallois and private lenders for their generous help in organizing this beautiful show.